AFLW R3: Match Highlights All the action from Olympic Park Oval in Melbourne as the GIANTS take down Collingwood on their home turf. Vice-captain and former Magpie Alicia Eva celebrates a win in her new colours. The GIANTS have secured their first win of the NAB AFL Women's season with a 13-point away-from-home triumph over Collingwood. The GIANTS' 7.6 (48) to 5.5 (35) victory leaves Collingwood winless after three matches and almost certainly out of the race for a Grand Final berth. The match came to life in the second half, with momentum continually swinging between the two sides. But in the end, the weight of inside 50s (37-18) proved to be too much for the Magpies defence missing an injured Stacey Livingstone, who will undergo surgery on her shoulder this week. The Magpies, boosted by the additions of Moana Hope and Meg Hutchins – the veteran defender picked for her first game this season and playing up forward – had started full of purpose, kicking the opening two goals. 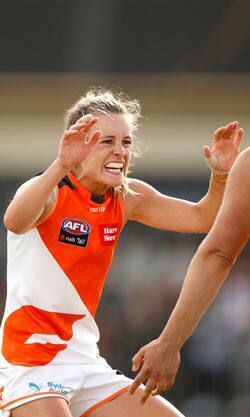 But a Cora Staunton-inspired GIANTS owned the second quarter, albeit inaccurately, kicking 1.5. Staunton kicked three behinds, while teammate Aimee Schmidt was sharper, with two goals in two minutes. Staunton was also forced from the field just before half-time after copping an elbow to the face while tackling Magpie Sophie Casey. Coach Alan McConnell said she would require an x-ray on her "bent" nose, and may not fly back with the team on Sunday night. Midfielder Courtney Gum kicked two goals in the last quarter to wrest the game away from a dogged Collingwood, who had been given late hope through a Hope goal. Successive goals to GIANTS key forwards Jacinda Barclay and Phoebe McWilliams put the game beyond doubt. It was a "devastated" Collingwood coach Wayne Siekman who spoke post-match, making the point the much-discussed guidelines set down by the AFL was making life difficult for his players. "It is what it is," Siekman said. "It's hard because you go to a game like last night's (Carlton v Brisbane) and you're trying to see the changes and what you can implement and what you think you can do. You see things start a different way, then the umpires adjudicate it differently, then the next day it's back to a different way, it's hard to get consistency. "Our players are trying to learn the game, because they haven't been in a TAC Cup program, they haven't been playing elite football for five years, they're all still learning. It's so hard to keep adjusting and these poor females are having to keep adjusting. Imagine what their brains are going through." Adding salt to the wound, former Pie Alicia Eva was one of the GIANTS' best, with a game-high 23 touches forcing Siekman to put Britt Bonnici on her as a tag in the fourth quarter. But it was to no avail, as Bonnici's former opponent Gum bobbed up to kick those two important goals. The GIANTS' win came on the back of sheer weight of inside 50s. The GIANTS' second quarter return of 1.5 could have won the game there and then if they had kicked accurately. But if you keep kicking at goal, the tide has to turn at some point, and it did in the last quarter. The GIANTS followed their scoreless third term with five goals straight in the fourth and finished with an inside-50 count of 37-18. While Tayla Harris may have struggled against her former club on Saturday night, Alicia Eva was one of the GIANTS' best against her old Collingwood teammates. After requesting a trade up north, Eva has fitted in seamlessly, adding some much-needed nous to the GIANTS' line-up. The tireless onballer ran riot, recording a match-high 23 disposals, three marks and three tackles. Her pace and creativity was something the Magpies desperately missed at points during the match. All eyes were on reinstated Collingwood forward Moana Hope, returning for her first game after her omission last week. It was a mixed day for last season's marquee signing, who marked strongly but struggled with her field kicking. She kicked a stunning dribble goal from the pocket in the third term, as well as a gimmie from a 50-metre penalty in the goal square and has probably done enough to hold her place. GIANTS coach Alan McConnell has been around top-level footy circles for decades, but the win against Collingwood was his first as senior coach. McConnell was the interim coach at the tail end of each of Fitzroy's final two seasons in 1995 and 1996 but did not record a win. He came to the post-match media conference covered in (hopefully orange) Gatorade from an exuberant playing group and said during his Fitzroy days there was "zero chance" he thought his first senior win would come from coaching a team of women. Collingwood travels to Alice Springs for a daunting match-up against Melbourne, while the GIANTS takes on a rejuvenated Adelaide at Blacktown.